When I first started guiding at Londolozi, I had noticed a brilliant photograph hanging up in the Londolozi Creative Hub captured by fellow ranger James Tyrrell. It was a photograph of the Inyathini male as he jumped from one rock to another, over a pool of water at a place appropriately named ‘Water on the Rocks’. Not only was this something incredible to witness, but James had captured the moment excellently. 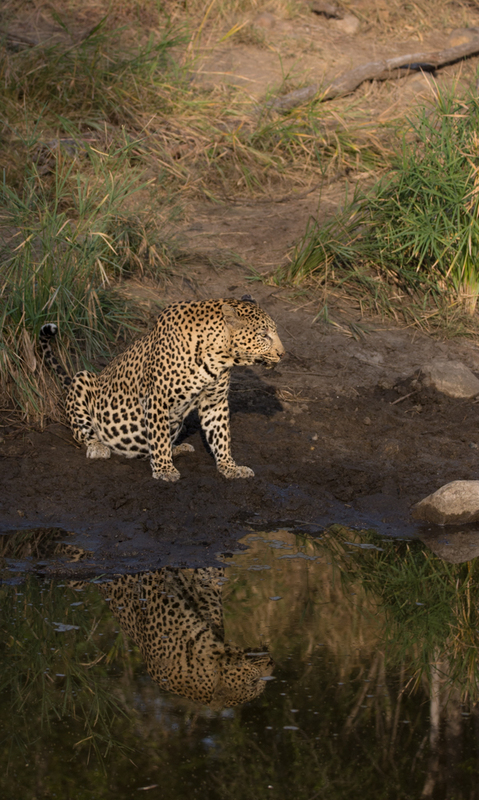 The leopard was bathed in golden morning light, and his reflection in the still water in the foreground added a mesmerising element to the photograph. 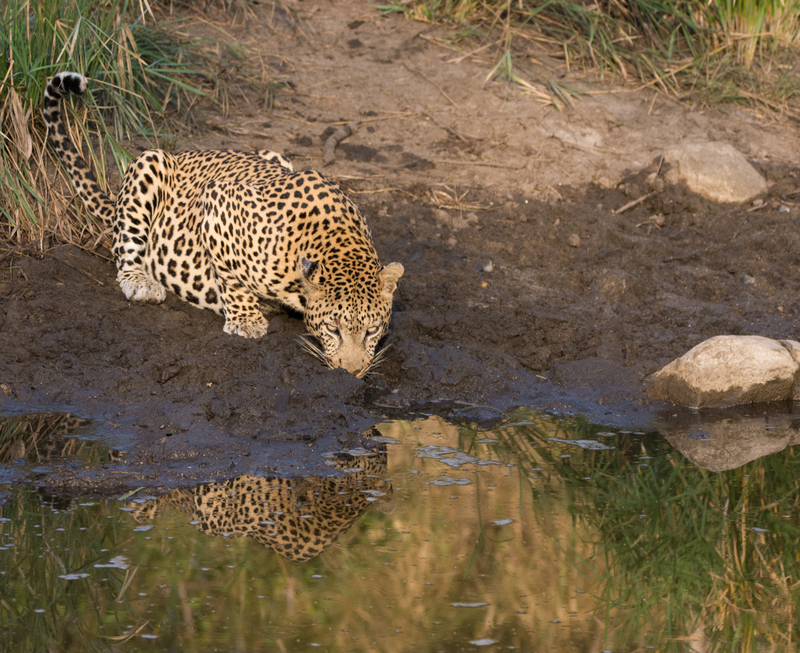 Ever since then, I had envisioned capturing a similar image (of any leopard) at the same spot. 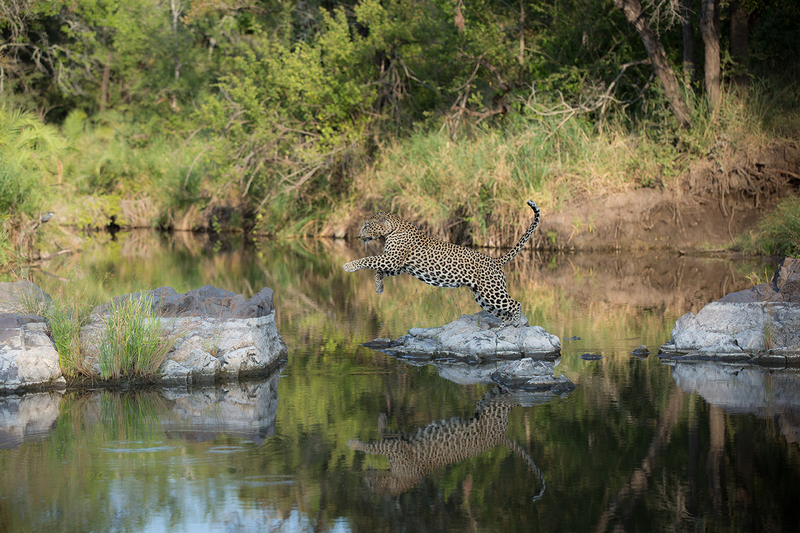 James Tyrrell’s photograph of the Inyathini male leopard leaping over the gaps at Water on the Rocks. In the last year or so of guiding here, due to the fact that it is an area of overlapping territory for a few leopards, I have viewed numerous individual leopards at this very spot either just passing by, resting in the shade, feeding on hoisted impala kills nearby and even drinking water, but on none of these occasions had I witnessed any of these leopards walk over, or jumping across the rocks in the middle of the pool of water. I had eventually accepted that what James had witnessed was incredibly rare, and I had started to give up on the idea of capturing a similar moment. That was until one week ago when the unthinkable happened! We were in the area that morning, following up on the barking alarm calls of some nyala. 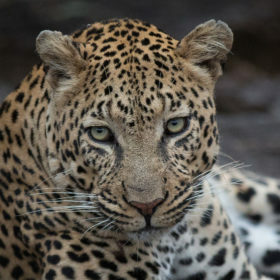 After a while of driving around through the relatively thick vegetation associated with the area, tracker Euce Madonsela spotted the young male cub of the Ndzanzeni female. After a little while observing the young male’s somewhat skittish behaviour, we came to the conclusion that the Ndzanzeni female had left her cub behind while she went off on an early morning hunt. In an attempt to limit the nervousness of the young male, we left the area, moving further away hoping to try find any sign of his mother. Euce and I agreed that checking the area around Water on the Rocks would be a good area to begin the search for the female. On the way there, I had began the conversation with my guests about the sheer beauty of the area we were about to explore, and I even went as far as to explain the dream photograph that I had in mind, all the while hoping that we would find the Ndzanzeni female nearby. We arrived at Water on the Rocks and there was no sign of any leopard. 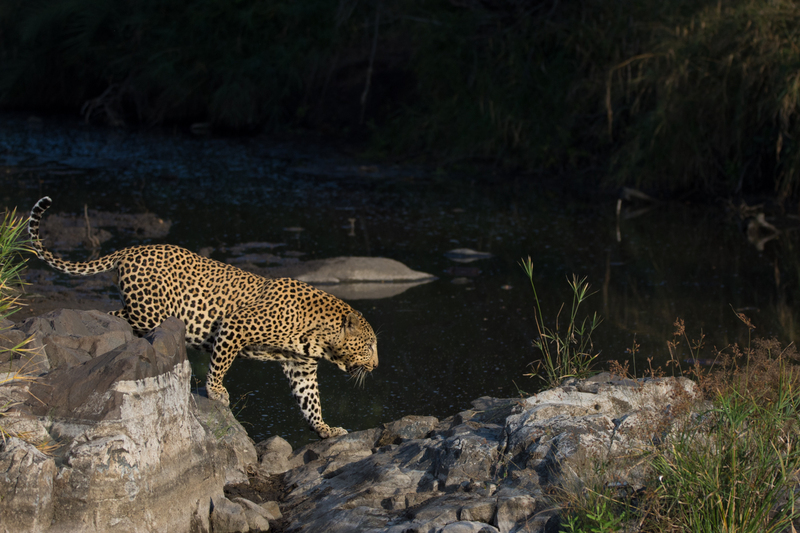 I used the opportunity to demonstrate to my guests the type of photograph I had envisioned if a leopard was to walk across the rocks. We decided to move on and broaden our search. 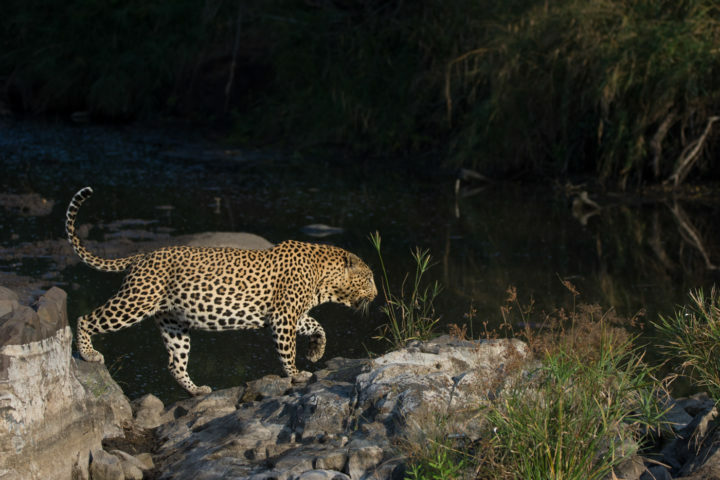 Around the next corner, staring directly into the rising morning sun, Euce pulled off an incredible spot of a leopard about 150 yards away. We drove a little closer to see which leopard it was, and to our surprise, it was the Inyathini male and he was walking directly towards us. After watching him pass the vehicle, we turned around and began to follow him as he made his way back towards where we had just come from… Water on the Rocks! For a moment I thought to myself, “Could this be the day?” Without wanting to get too excited and to avoid any disappointment I tried to remove the thought from my mind. We continued to follow. The leopard made his way down towards the water’s edge and crouched down to drink. 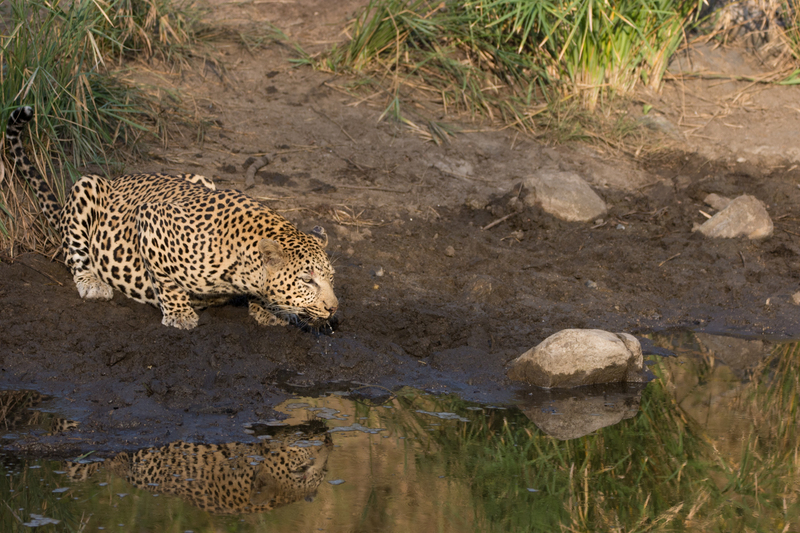 He had a full stomach, indicating that he had finished off a kill recently and we watched and photographed as he drank, his reflection in the still water adding to the beauty of the scene. He stood up after drinking, let out a few rasping territorial calls, and made his way toward the rocks in the centre of the water source. I scrambled to position the vehicle in the event of him crossing, and we waited with bated breath as he stood on top of the rocks and began to cross… this was it, the day had come! My guests and I scrambled for our cameras, and in the process I urgently spoke out “IT’S HAPPENING, GET READY!! 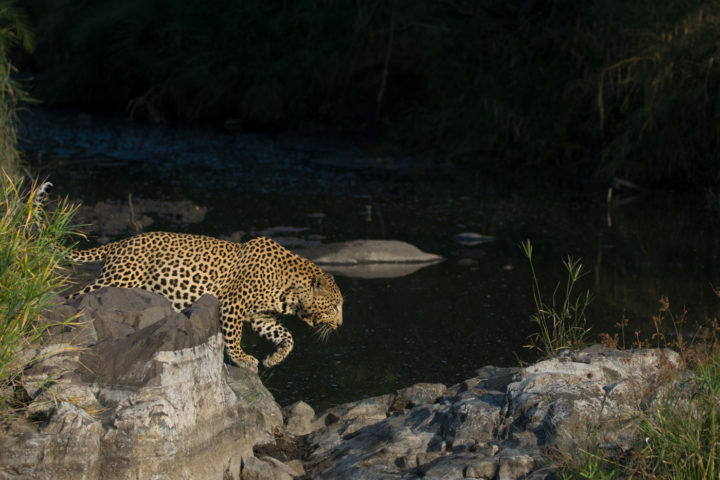 !” and no sooner had the words left my mouth than the leopard crossed the rocks right before our eyes and we captured the moment exactly as I had imagined it. He walked off into the shadows, still calling, the noise reverberating throughout the drainage line and we all sat in silence, still unable to register what we had just witnessed. We had captured my dream photograph! In between drinking, the Inyathini male began to give off a territorial rasp which reverberated throughout the drainage line. The first indication that he might decide to approach the rocks. He stood up, and glanced towards them as if he was planning where he would cross. And so it began… He walked up on top of the rocks and began to cross from one side to the other. He seemed to pause, just for a moment, almost ensuring that we captured him crossing, before continuing on. After he had crossed, he made his way into the dark shadows further upstream in the drainage line, calling continuously as he disappeared out of sight. lovely scene to have recreated!!! Leopard Jump very good/excellent but what about the next picture of the jump. 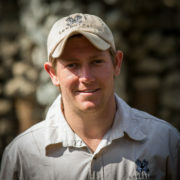 Last time I was in Londolozi , I got three pictures of the jump around I think the same place. You see, dreams do come true Alistair. Good for you and the guests. Beautiful pics of a most beautiful animal. Cheers.